The Gulls held on despite a late surge from their Devon rivals after Rene Howe had given Torquay a 15th minute lead. Torquay had conceded goals in the last 10 minutes in their previous six games, costing them nine points. 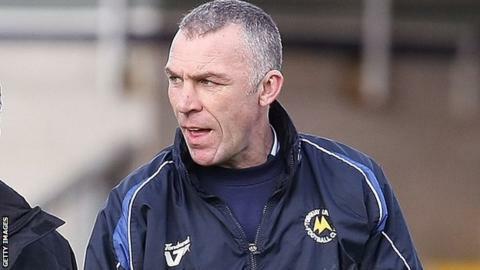 "I'm sure the players had that little bit of doubt, but they are fearless and they're all delighted," Taylor told BBC South West Sport after the win. "They've worked hard for that and Exeter didn't score so it does break the hoodoo. "We were aware of it, but it's no fault of anybody, it just happens, there's no reason for it, it just happens." Taylor took charge of the side in the absence of manager Martin Ling who was ill and watched the game at home on television. "It is a little bit different, I've had to influence the players and all that. "I have enjoyed it, but it's been a tough day. "Martin wasn't well so it was wise he didn't make the trip today. "Getting three points is a massive boost to the side."